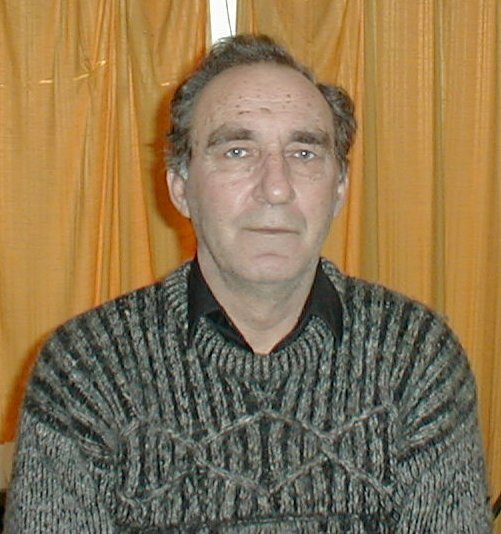 The following communications from John Waltrowicz arrived in July 14 2001. He has given us permission to put his memories and stories on the Website. We have lightly edited his notes. Just found your web page on West New Britain. It brings back memories. I was there from 72 till 75. I worked as a curriculum adviser for the education department, and travelled extensively over the island. I was first based in Hoskins, then Kimbe. I was the one who reported the Speaker of the House for his rampage at Silanga Primary school. My role in WNB was as a curriculum adviser with the education department. 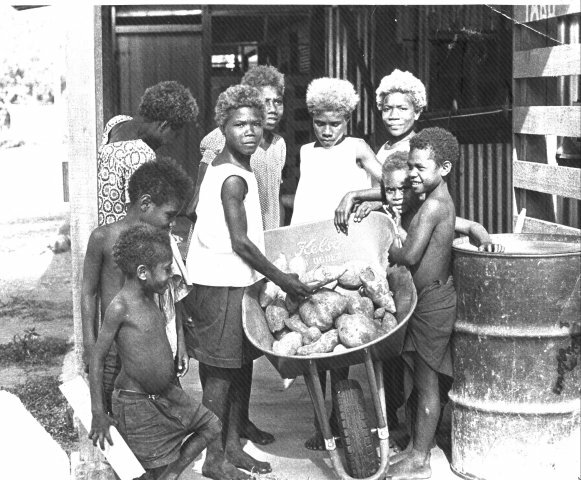 I had come over from supervising Lutheran schools in Morobe sub district. The job was to implement new curriculum being developed at headquarters. It involved visiting schools. In WNB there were 72. I saw a lot of them, but was really spread thinly. But I saw a lot of places, and met many people. Most were New Guinean teachers. I had little time to socialise with fellow expatriates. But I did so much enjoy my stay with Catholic priests on lonely outstations. Amazing people. Likewise some of the kiaps were wonderful hosts. But the priests were special. They were dedicated for life. Very strong minded men. The following is a photo of children in the Valoka Catholic Primary School in 1973.
the vegetable to the Nakanais. I washed that print in the sea off Hoskins. Lasted a long time. The good father furnished one of his people hardboard and enamel paint and there was produced many beautiful paintings.. somewhat like aboriginal paintings. They decorate the church and hall. It was something really special, this art noveau. I saw similar artistic talent at work in the Kotna Lutheran church in the Highlands, where an evangelist from Siassi had done some marvellous art work in the church. I made friends with the headmaster Bernard Mota, and other teachers at the school. I checked your place on the map. A very isolated bit of coastline. I don't think I ever got there. I have however travelled on the MV Garua quite a few times. Before I came to WNB I had been at Menyamya. It was interesting to again find Kukukukus at WNB in the oil palm project. I have quite a few slides but they are old and will take some sorting. However what I have been searching for is music. I have just been trying to resurrect some standard 8 films I took at Hoskins, Kimbe and Talasea, and need to add Nakanai singing to some of the dancing. You know how they used to hold tree branches and sing in harmony. [NOTE: if anyone knows where John can obtain Nakanai music please contact him at johnwal@melbpc.org.au.] The old films have not stood up very well. I had bad focus problems too with the cheap camera I had. However they have come up reasonably on my computer and I aim to edit them, and do some voice overs for the benefit of my family. I too have some stories to tell. And yes I have been a grateful guest of Fred Hargesheimer at Ewasse, What a fantastic man! There is much folklore about Fred H. A story was about a government officer visiting, and seeing a couple of disreputable looking characters hanging around Fred's doorway. He shouted 'rousim' bushkanaka' to them, and Fred heard. He recognised them as two of his old friends who had rescued and sheltered him so long ago during the war; who had travelled a long way to see him. Fred welcomed them into his home as honoured guests, and the government officer was a little embarrassed to say the least. Or I hope he was. He came from Tasmania which can yield the odd red neck at times. Fred was one of the early pioneers of computers. He worked for Sperry Rand and they had developed one of the first computers. I think he ended up on the board of this company. When I stayed with him he was into short wave ham radio. He talked to people all over the world, and was contemplating using slow scan television. Don't know if he got around to that. There were lots of Tolais working in WNB at the time Mr Jack Emmanual the district commissioner was murdered. I was a lone white figure on my little motor bike travelling from school to school, even in the middle or the oil palm unrest. One little project I attempted was never realized. At in-service training week I asked all teachers attending to bring me a traditional story they knew... especially some of their creation myths. I received a mass of wonderful stuff. I was going to duplicate it and distribute it to schools as a reading resource. I edited it and put it in the hands of the typists at the education office. Very slowly stencils were typed. However I left WNB and they were still unfinished and I had no copies. It probably came to nothing. But it is sad when something is lost. Same thing seems to happened at Menyamya when the first primer using the Menye language seemed to have gone down the drain when the missionary who started it returned to Australia. I think he was the only white person to learn Menye. The proof pages were strewn over the floor of the little printery on one of the outstations. However all was not lost. The founding missionary there played an important part in the production of the Newpela Testamen. To translate some of St Pauls more philosophical letters into Pidgin is quite an accomplishment. Just to add to the saga of the collected stories. In my case it was really that the new bureaucratic class in PNG often didn't value traditional things as they should have. I think they actually impeded me in making off with the proofs of the stories and had no intention of doing anything about them. It was a pity for some of the stories shone like diamonds and are now probably lost. I think of some of those remote places of PNG and imagine that they will proceed relatively unchanged for the next hundred years. They are just so remote from civilization. Remote even from their own government. Their economic potential is limited, and it seems that they have really no place in the twenty first century. That is if the breakdown in services continues in that unfortunate country. Perhaps the missions will become their only link with the rest of the world. I do recall that the Japanese were ripping out the timber, and the sea life in many areas making the future bleak for these people. I sort of had a sense of hopelessness at Menyamya. The economic future was so bleak! They grew strawberries that had to be air freighted out to major cities... expensive strawberries. The oil palm projects looked more hopeful but the isolation is tremendous.. and the damage to the environment was a very big problem. I don't want to offend anybody unwittingly. Mostly I have nothing but good to say about fellow expatriates in PNG. I am a bit biassed though having first served with the Lutheran Mission, then joining the Government. My children were educated while at Hoskins at the English language school at Kwalakessi. This was a school run by the Japanese timber getters. I had a wife, Wendy, and five children who I think benefited from the simpler lifestyle. My wife enjoyed the environment of Hoskins and Kimbe too. Much better I think than the life of a country school teacher. Household help for such a large family was great. At Hoskins the women even played tennis. I still remember big green frogs sitting on the tennis court in the evenings. I might mention that my eldest son lost the sight of one eye on our return and the local medical authorities put it down to either malaria, or anti-malarials. So that was one price I paid for going to PNG. Hope it did some good. I neglected to tell you of two books I have that are not in your bibliography. David Johnston of SIL translated some Nakanai stories in two books while based near Hoskins. One was 'La Vigilemulimulile Pakasa Uru me Tulagola". (Stories about Big Wallaby and Tulagola the Dog.)(1974). The other is a love story called "Maguri" It's a beautiful story and very poetic. Johnston R and M.(1972) MAGUREI (first printing) Summer Institute of Linguistics, Karumpa, Papua New Guinea. Johnston R.L. (1974) 'La Vigilemulimulile Pakasa Uru me Tulagola' (diglot edition in Nakanai and English) Summer Institute of Linguistics, Ukarumpa, Papua New Guinea. Don't know if you saw them but here is a shot of the hot springs past Hoskins. These were home of the wild fowl. Similar to the Mallee Hen of Australia which laid its eggs in mounds and let the sun's warmth incubate them. the New Guinea wild fowl laid its eggs near thermal springs. I did not venture too close to them for the ground was unsafe, but certain local clans had egg collecting rights. They used to burrow into the ground and retrieve the eggs. A brisk trade occurred with these eggs with other clans. To get to the place one had to go past Catholic Mission Vavua, and continue along a rough track for some miles. Similar springs occurred in other parts of the island. Known by many as ples nogut. The stink of sulphur fumes, the hiss of steam and horrible bubbling and gurgling under the ground and signs of cave- ins did not encourage much exploration. I arrived in the evening so the light wasn't much good either. Don't know why the pictures were bluish. Possibly from the steam . Before I went to PNG I was a country school teacher. I had worked as headmaster of many small one teacher country schools. After PNG I just worked at reestablishing myself in my teaching profession in the big city. Then I got interested in computers. But a bit late in life I think. Still its fun. On my return I had to work in the big city of Melbourne, and had to adjust to city life and many non English speaking migrants in our schools. I also worked nights doing a Graduate Diploma to increase my qualifications. I clawed my way up to vice principal. I lasted till I was 57 and the change of government brought downsizing in the teaching service. I took a voluntary retirement package four years ago, and have worked since as a relief teacher and have taught in two Islamic schools the past two years. What an experience. It was like being overseas again. But I have developed a lot more respect for Islamics. 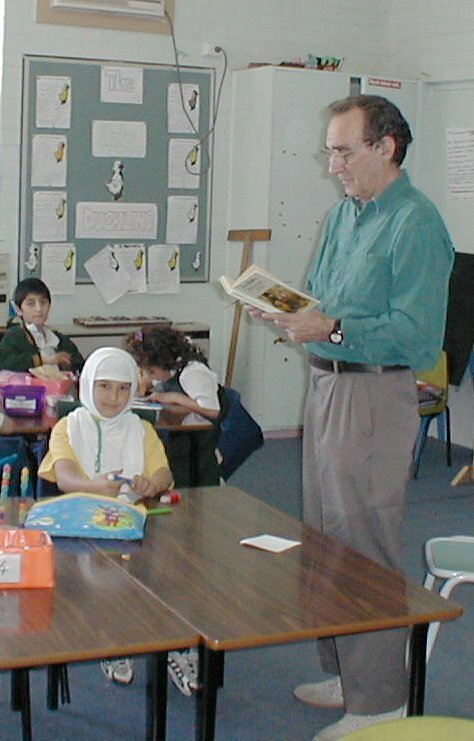 This photograph was taken in King Khalid Islamic College in 2000. After semi-retiring I returned to University and got my M.Ed specializing in computer education. At the moment I am doing relief teaching, and work at home trying to develop a multi media interactive computer game that makes kids read.. an adventure game with plenty of text, and plenty of bells and whistles. Very challenging. I have overcome technical learning curves but get writer's block.